TWO // This sale is running for one and a half days this time, so if you want an item don't waste any time...grab it fast!! The start time is tomorrow at 8am and it will end Friday at 1pm. THREE // Shipping is FREE!!!!! This means there is no minimum order so checkout as many times as necessary! FOUR // For a little more help with sizing, I highly recommend using the Lilly True Fit guide to help you decide. And I would do this now instead of waiting until tomorrow. FIVE // Lilly will be using their virtual line again this year. The last two sales the lines have moved super fast, but if possible, I would have two types of technology ready. I usually have my laptop and my phone ready, so that I'm in two virtual lines. And now, time for the fun part.......giveaway number one! 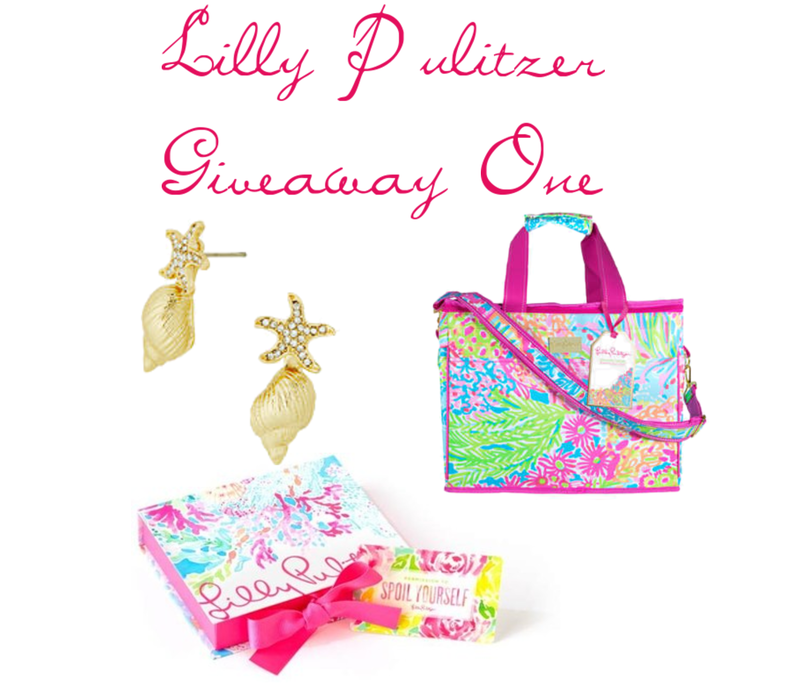 Included in this giveaway is a $50 Lilly Pulitzer e-gift card, Insulated Beach Cooler, and a pair of the star bright earrings. To enter all you need to do is leave me a comment and let me know what your favorite print is this season. My favorite this season is the Palm Beach Coral. It's such a fun print and the colors are gorgeous! Good luck, and be sure to check back first thing in the morning for giveaway number two! Palm Beach coral - - makes me ready for summer!! I love the Fan-Tastic print! So excited for the sale tomorrow, thanks for all the tips and the fun giveaway! Loving Brilliant Blue Wade & Sea! Love the Coco Safari can't wait for the sale and to add more Elsa Tops to my collection! I like the Multi Shell Of A Time print. I like the Palm Beach Coral too!! Thanks! I love the Magenta Oh My Guava print! So pretty! Coco Safari is amazing! Thanks for the tips! Jellies be Jammin is super cute! Thank you! Wade and Sea is bright and fun! I was so happy to see jellies be jammin come back for luxletic. I splurged on the leggings as a gift to myself after becoming a cycle instructor and would love to add more pieces to my wardrobe. Can't wait for more pictures of your house! Absolutely swooning at everything so far! Can't wait for the sale!! I really like Sunken Treasure!! Wade and sea is my favorite! I love Wade and and Sea and Palm Beach Coral! Palm Beach Coral for sure, just love it!! Too many prints to choose from! Jellies be Jammin is beyond cute (if I had to pick one!). I'm loving the Palm Beach Coral as well! I love the indigo sunken treasure! Love them all, but Coco Safari is probably my favorite! I have to pick sunken treasure! I love "Tons of Fun"! I love the Coco Coral Crab! Wade and Sea! So excited for the sale! It's a tie between Coco Safari and Coco Coral Crab!! My favorite is the Tons of Fun print! Tons of Fun - love the blue Ikat! Wade and Sea -- I have the luxletic pants in this and LOVE them! My recent favorite is coco safari, I am a sucker for pineapples. I like tons of fun!! Jellies be Jammin! Love it! Can't wait for tomorrow morning! I love the coco safari print this season! Happy New Year!!! My favorite print this year is definitely Wade and Sea. Happiest New Year--The new take on Jellies Be Jammin is my current favorite! So excited! My favorite is tons of fun! I LOVE tons of fun! Hope they release little girls in that print!!! Wade and Sea is my favorite this season! I love the blue prints that Lilly does. Palm beach coral is my fav too!! I can't wait for the sale! I love Coco coral crab!!! I love the COCO SAFARI print - pink and blue and pineapples!!! I completely agree, Palm Beach Coral for the win! Wade and Sea for a close second! Wade and Sea is my favorite print. I just love the cool blue and green tones. So lovely! I really like Coco Coral Crab! Coco safari! Can't wait for the sale tomorrow! Love Sunken Treasure! So happy! I also love the palm beach coral!! Thanks for doing this! I love the Wade & Sea :) Thank for the opportunity! Ahhhh I'm SO glad you reminded me of this! Where is my head? Coco safari is fab but to be honest, I've never DISLIKED a print! Eeek so pumped for this! Xoxo Thanks gorgeous! Jellies be Jammin! So adorable! I love Palm Beach Coral as well, but I'm also so happy they brought Jellies Be Jammin back. I like the Fantastic print. I love the Sandstorm print! So many great choices. Oh shucks!!! Just got a dress in it and can't wait to wear. Plus I love oysters! Coco Safari! You can never go wrong with pineapples, as a true symbol for welcoming others to your home! I feel this is iconic to everything Lilly is about-welcoming others to the party, because life is a party so why not dress like it? In pineapples of course! I love the Bright Navy CoCo Safari! I got the baby shift for my 20 month old and it is precious! The Palm Beach Coral is also my favorite! Although there really isn't any Lilly print that I don't like! I'm hoping to score a couple of baby rompers tomorrow for my new twin nieces! The Palm Beach Coral is my favorite!! Can't wait to see sale tomorrow!! Jellies Be Jammin! It is such a fun and pretty print. Can't wait for the sale. yay! I love so many but my current favorite is Coco coral crab! Oh my, so hard to choose a favorite! I think I'd have to go with Fan-Tastic though, it's such a fun print! The palm beach coral is my favorite. Agree'd...palm beach coral for the win! It screams summer! i am partial to sandstorm but love them all! Palm Beach Coral is my favorite, as well! Love the color combo! I'm loving the Palm Beach Coral too!! Bright Navy! Love the pretty pink and navy. I love the Magenta Oh My Guava print - so perfect! Cannot wait to stock up for my trip in March! My favorite is the Dragonfruit Pink Toucan Can. Adorable! Palm beach coral has me dreaming of warmer weather! Wade and Sea is my jam...love love love! Coco coral crab for sure! Coco safari! Love the pink and navy combo! Sunken Treasure is my fav this season!!! my favorite print for this season is coco coral crab. Love the blues and pinks! I really like the Wade and Sea! I also love the palm beach coral!! Palm Beach Coral and the Coco Coral Crab was really pretty too! Tons of Fun is pretty snazzy! I love Coco Coral Crab! Love love love Wade and Sea and the Jellies be Jamming pop up ahhh! Hard to choose, but I think Jellies Be Jammin is my favorite! I love tons of fun but coco safari is also adorbs! Coco safari-love the navy and pink combination!! My favorite print is "Tons of Fun"! The Multi Jam Out is a wonderful print. Just beautiful.